As you may or may not know, I am a Cincinnati Reds Fan. A huge Cincinnati Reds Fan. I spend 365 days a year following all Reds news along with 162 days a year watching the Reds play ball on my MLB TV Premium Subscription. I also have a goal in life to visit every Major League Baseball Stadium…ideally, seeing the Reds play in each one. This year the Florida Miami Marlins opened up a new ballpark, Marlins Ballpark. Since the start of the season, I have gone to 2 games at Marlins Ballpark. While completely unimpressed with the stadium (baseball is meant to be played outside), the Marlins do offer the largest assortment of food I have ever seen. On our first visit back in May, we tried the Veggie Burger. Let me just say, that is One Beany Burger. The Marlins offer so many different food options in addition to the normal ballpark fare. Many stadiums have recently started to offer Veggie Burgers which I do appreciate. 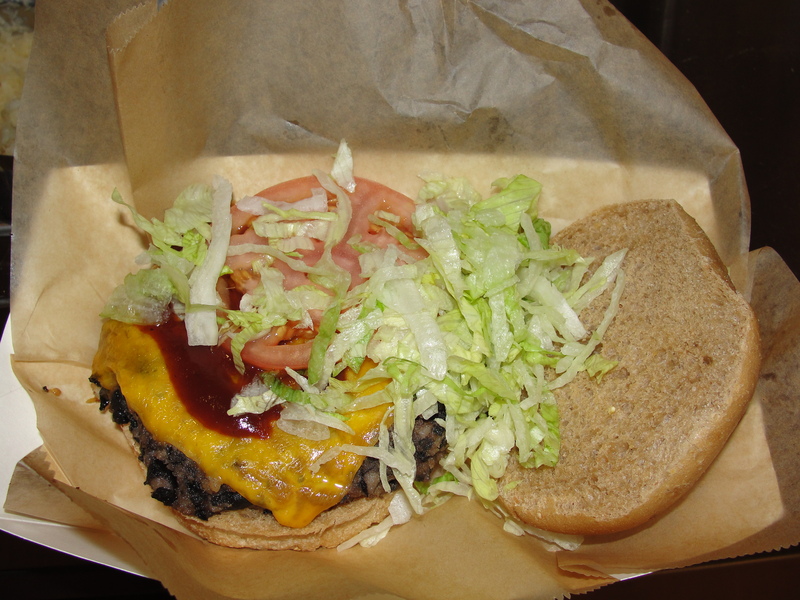 While most places veggie burger consists mainly of veggies, the Marlins feature a veggie burger with a base of rice and beans. I would say the ratio of rice to beans is pretty close to 50/50 and the only other additions to the burger patty are some seasoning spices. This burger is served on a wheat bun topped with cheddar cheese, a touch of bbq sauce, lettuce and tomato. I apologize for the lack of photos…it was too difficult to hold the burger and my camera at the same time. I shared this veggie burger with Mommy and we both really enjoyed it. The wheat bun is soft and has a very subtle wheat flavor. The veggie burger itself tasted very beany and the flavor of the black beans, stood out to me more than the flavor of the white rice. The burger patty was somewhat soggy and only room temperature. The cheese was melted into the burger but did not really have too much flavor on its own. I’m not sure why they opted for bbq sauce, but the flavor was tangy and smoky – not really mixing with the rice & beans flavor in the least. As for the shredded lettuce and the tomato, both were fresh and tasty. We added some spicy mustard to some bites of this burger which I found to enhance the flavor of the patty itself. The veggie burger, I believe, was $7 or $8. I know for sure it wasn’t more than $8. I found this price to be totally fair and on par for ballpark food. The burger was a decent size and would easily feed one person or serve as a snack for two. I would suggest that the Marlins cook up the patty just a little bit more – this would help to better bind the rice & beans and provided the burger with more texture. While I don’t think I will ever like the indoor feeling of baseball, I do like the fact that this veggie burger is available to me at Marlins Ballpark. I think its safe to say that not only is this the best ballpark veggie burger I have had thus far, but, it is also One Beany Burger.